Finally decided to upgrade the brake system on my 56 as brake fade seemed to be worsening and it was just time. Besides that I priced all the components and for a bit more I could get non powered disc brakes. I started my search comparing the various kits supplied and settled on Jim Carters for the front spindle components—bearing adapters, calibers, discs. I placed an order with Classic Performance Parts and purchased their master cylinder setup. Received in fine shape, put it all together and voila– the perfect setup. Having all the components I started the installation by first removing the spindle components, i.e. 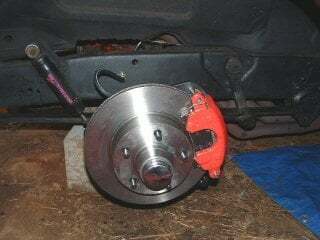 brake shoes, backing plate, and steering arms. King pins were sturdy so nothing to do except servicing them. Knowing something was severely binding as it was a bit difficult to move the spindle to/fro as if turning left or right so something was not right. I attempted to grease but had no flow, removed the zirk fitting and found that the old grease had hardened to the point it had to be dug out. Using a bit of carb cleaner, flushing the old grease out, replacing with new revealed a whole new feel. I had to apply a bit of pressure on the grease gun to get it flowing through the king pins but finally did. Upgraded the tie rod ends which is also highly recommended as more pressure will be applied through them during stopping. Now to remove the ball from the steering arms–I’ve heard of the difficulties of this task and decided to take the assembles to the machine shop of my job. After grinding off the peening of the ends, a close inspection and you can see the circular pattern of the actual tie rod ends-I marked these with sharpie pen, many have said that a 40 ton press wouldn’t budge them so I took others advice and drilled a small hole through the tie rod end stud that goes through the arms and progressively went bigger till we removed much of the material. Quiet a few blows with a 3lb sledge didn’t budge it, please remember that I am an electronics tech by trade and not a machinist by no means. The head machinist came in and inquired to my dilemma and offer his expertise. He put the ball end in a big vice, clamped down on it with a bit of authority then took a smaller hammers and delivered a sharp whack to the opposite end of the steering arm attempting to spin the arm on the ball stud. Two whacks and it broke the seal, we were then able to punch them out with little effort. 20 minutes and we were done with both of them. I removed all the old brake line and replaced with new, was dreading this task but it went much smoother than ever expected. 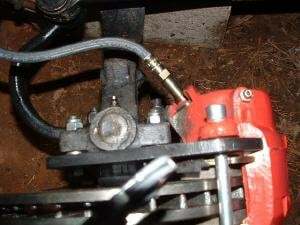 Only problematic area was working around the frame mounted steering box. I went up and over instead of behind… I mounted the adapter plate for the new calipers with the supplied hardware. Now onto mounting the components to the stock spindles with the supplied kit from Jim Carters. First item to install was the inner bearing adapter, I cleaned up the spindle with a piece of Emory cloth for smoothness, the adapter does fit very very tight. I applied a bit of heat from a propane torch for a bit of expansion to the metal and used a short piece of exhaust pipe material to push the adapter on the spindle with a 3lb hammer. One side went fairly easy but the other took a bit of persuasion. Use CAUTION and don’t damage the adapter during this process. A quick packing of grease to the inner and outer bearing and all was together. 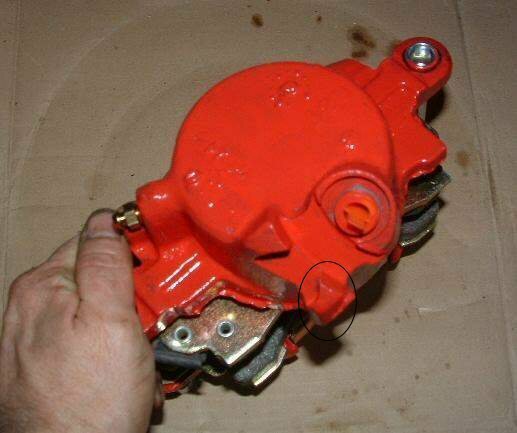 The direction with the kit was very thorough–I went to mount the calipers and found them not to fit correct as there was a large casting nub that came in contact with the axle housing causing it not to fit flush. A quick trip to the grinder fixed that-a paint touchup and ready. This completed all the hardware and bleeding the new system was next.. The mounting of the master cylinder on the frame causes the cover to be very close to the bottom of the cab and it’ll take a refill to completely fill the system. I found it easier to pry the clip off from the sides with screwdriver and use a squeeze type bottle to fill it. Bled the rear first–then the front caused a nice firm pedal and now ready for the road trip to the alignment shop then to cruise a while. UPDATE: I am truly amazed at the new feel of the system, braking is much smoother and no fade or pull to either side. If you’re planning on doing any particular upgrade for safety-this is the one to do!! !